George Bernard Shaw had few kind words for Gilbert and Sullivan, particularly their Pirates of Penzance, which he once compared unfavorably to, of all things, Ibsen’s The Wild Duck. Both works, he thought, focused on benighted souls who were slaves to duty, but in the operetta, that notion amounted to little more than a topsy-turvy satirical joke, while the play treated it as a fanaticism that can lead only to human tragedy. Gilbert, according to Shaw (who perhaps missed the point), could always see beneath the surface of things but never through them. As for Sullivan, the composer received a backhanded Shavian compliment for his unfailingly skillful and refined workmanship even if his basic musical material was essentially cheap. So much for a canon of spirited musical theater that has appealed to English-speaking audiences ever since Queen Victoria’s day. Yet when Shaw and G&S found themselves rubbing elbows at Lincoln Center last week, what came into view was not Shaw’s sneer but the works’ shared tradition. City Opera opened its spring season with a new production of Pirates, while across the plaza, the New York Philharmonic presented a concert version of My Fair Lady, that artfully condensed adaptation of the great man’s Pygmalion embellished by Alan Jay Lerner’s witty lyrics and Frederick Loewe’s deliciously tuneful score. If only Shaw had known. Surely the classic 1956 musical is an operetta in all but name, and perhaps the last descendant of a genre that sprang directly from those imperishable Gilbert and Sullivan masterpieces. It’s all there, from Henry Higgins’s breathless patter songs to Eliza’s infinite musical variety, Doolittle’s music-hall showstoppers, and the extended finales in which plot and character are faithfully developed—there’s even the typically Gilbertian harebrained tenor (Freddy) to sing a gorgeous love ballad. Shaw’s social commentary probes beneath the jokes more deeply than Gilbert’s satire, especially when he levels a cold eye on British class distinctions in all their silliness and then demolishes the hypocrisy of middle-class morality. Much of that survives in My Fair Lady (and what a sly title: a phonetic rendering of how Eliza would pronounce “Mayfair Lady”), but basically we are still in the never-never land of classical operetta with a strong British accent, which is not such a bad place to be. Come to think of it, even Shaw might not be so disapproving in 2007. His G&S opinions were expressed when he was young, the pieces were new, and Wagner represented the avant-garde. Late in his life, when the Savoy operas showed no signs of losing their popularity, Shaw admitted that he might have been too harsh and had underestimated Sullivan especially. In 1933, he wrote, with tongue only partly in cheek, “We compare the score of The Mikado today not with the score of [Offenbach’s] Les Brigands but with that of Die Meistersinger.” It’s just possible that had Shaw ever seen My Fair Lady—amazingly, he missed it by just six years— he would have even appreciated the irony of being the librettist of such a gracefully designed, musically enriching operetta. Today’s admirers of Gilbert and Sullivan as well as Lerner and Loewe certainly have little to complain about. The Philharmonic’s semi-staged performance of My Fair Lady was by far the most successful of its recent forays into quality musicals, with James Brennan’s razor-sharp staging and Rob Fisher’s lovingly shaped reading of the score to give a superb cast every support. Kelli O’Hara is an Eliza in a million, her delicately brushed soprano up to every vocal challenge and mood change, while Kelsey Grammer moves from speech to song and back with an ease, security, and, yes, humanity that eludes most actors who play Henry Higgins. As for this new Pirates, director Lillian Groag reimagined the work as a manic episode from Monty Python, as zany cardboard cutouts tweaking late Victorian culture pop up everywhere. Oscar Wilde materializes, perhaps inevitably, when the Pirate King speculates on the workings of an ill-natured fairy; the Queen herself seems to be constantly whizzing over the stage inspecting every suspicious antic in sight. So much frantic energy may be just as well since it helped distract from a cast of spotty vocal distinction—only voices of top quality will do in this priceless operatic parody. Never mind. Pirates remains indestructible and G&S can survive anything, even the withering view of the era’s greatest playwright. 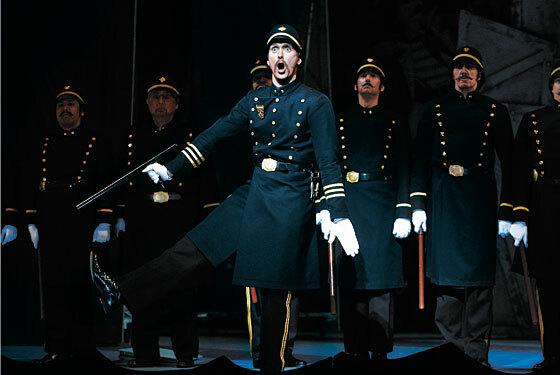 Gilbert and Sullivan. City Opera. Through March 31.